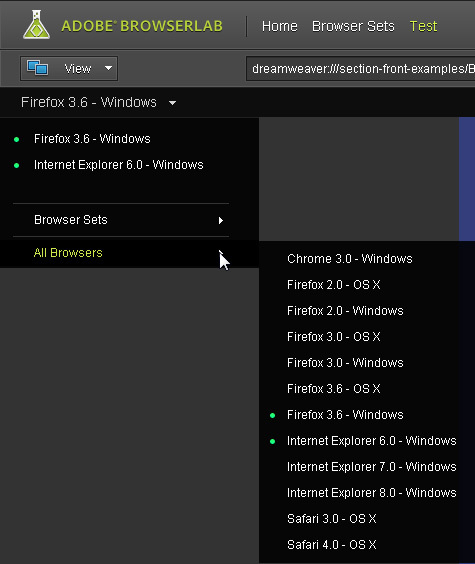 Set up new sites up faster in Adobe Dreamweaver CS5 and set up multiple servers for any site. This is a great way to manage a testing server and live server for the same Web site. Test your styles by turning any rule on or off — a great way to troubleshoot conflicting styles and see how your page will work without having to delete a style rule to test it. Get a preview of the code on your pages with this interactive feature that makes it easy to quickly identify how styles and XHTML work together in your page designs. 4. Spell Check in 37 Languages: si, oui, ja, da, yes! If you’re working on a site in multiple languages this feature will make your life easier and your site more accurate. Add slideshows, drop-down menus, and more with the Widget Browser, which makes it easy to add all kinds of special features from the growing list of widgets to your site. Most are created in JQuery or AJAX. Dreamweaver CS5 now supports multiple levels of include files so it can display WordPress themes better than ever. This improvement also makes Dreamweaver better equipped to handle two of the most popular, open-source content management systems, Joomla! and Drupal, as well. These enhanced features make it easier to edit the code, and the styles, for dynamic sites, including those created with WordPress, Joomla!, and Drupal. See what your pages will look like in a variety of Web browsers, including the dreaded Internet Explorer version 6, as well as versions 7 and 8, Firefox, Safari, and Chrome. Use CSXS to access Adobe Connect directly from Dreamweaver, a great way to collaborate with other web designers and show off your designs to your clients without ever leaving your desk (or changing out of your pajamas). This new suite of online tools adds everything from an eCommerce shopping cart to customer relationship management (CRM) tools to bulk email services. Adobe acquired this company and integrated their entire collection of online tools into Dreamweaver. Learn more about the service at www.BusinessCatalyst.com.